September 16, 2015 at 2:05 pm. Small group classrooms are integral to the spiritual life of the contemporary Church. They’re spaces of discipleship, where members and guests can digest the heart of what Christ is teaching us. They’re also places of prayer and intimate growth. As such, it’s important that small group classrooms accommodate a great range of activities and group sizes. Yet, they must also be intimate enough that individuals feel comfortable expressing their doubts, questions and struggles surrounding faith. It’s a delicate balance of familiarity and flexibility. When speaking of familiarity, some configurations of successful small group spaces include those meant for informal breakouts, with furniture pieces suited well to a living room or family parlor. Familiarity can also be accomplished with the use of warm tones and warm materials — warm-toned wood, carpeting, and interplay with natural light. It’s almost advantageous to think of these spaces as the living room space of a home; after all, they’re intended to cultivate intimate and personal exchanges. These rooms are often used by a variety of age ranges, from empty-nesters to young married couples — and even much younger Christians — which makes flexibility a key. Flexibility can be achieved through the use of operable walls and moveable furniture, such as stackable chairs and podiums. For the sake of flexibility, the accommodation of multimedia and A / V equipment — as well as sound — must also be considered. You want people in the room to be able to hear the teacher, but also to feel comfortable having a conversation in a normal tone, without feeling as though those outside of the conversation or classroom can hear them. Considering this, limit the use of hard surfaces, and avoid long, obtuse-shaped classrooms that make it hard for sound to reach all the way across. Depending on your church culture, you might want small group spaces to be used for instruction. This would require the more traditional elements of a classroom, such as a whiteboard and projection capabilities. In fact, the use of multimedia might be prevalent and necessary in small group spaces. Generally speaking, these spaces need about 20 to 25 square feet per person to accommodate all the necessary space for instruction and to feel comfortable for small group discussion. It may be your wish that the small group classrooms carry the same theme as the sanctuary, or that they remain more neutral so as to present a “blank canvas” for the activities that occur there. Either way, consider the image you’d like to present. Is it unified with the worship space, or in stark contrast? Changing the theme, color palette or materials in small group classrooms could help congregants make the shift between corporate worship to individual reflection. On the other hand, retaining the same theme helps to reiterate a particular temperament or culture — warm, relaxed or contemplative. 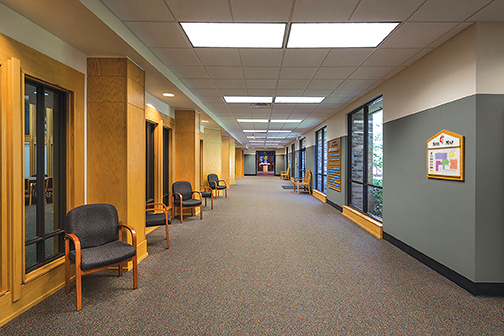 Other considerations for these spaces are their proximity to other important functions so they can be multi-purposed. Often, our church clients are faced with difficult decisions concerning budget and priorities. If positioned correctly, small group classrooms can serve functions outside of mid-week or Sunday discussion; they can also serve as meeting spaces for outreach groups, classrooms for a daycare or school affiliated with the church, or even social functions. The use of these spaces for mid-week services usually means locating them in a portion of the church that can be accessed independently of the main church in a wing of its own, or with its own entrance. As mentioned earlier, within the classrooms — especially those intended to be multifaceted — flexibility is key. 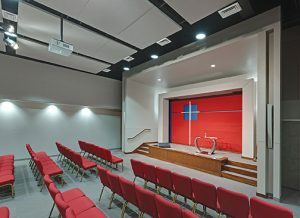 This includes the consideration of walls that open to allow three classrooms to merge into one, as well as adequate storage for each of the individual ministries using the space. Above all, it’s important that small group classrooms facilitate the feeling of belonging — to a church culture and to a body of believers they can trust. It is necessary that users of these spaces feel comfortable enough to divulge their thoughts, but also alert enough that they’re engaging in discussion and learning the tenets of Christian discipleship. Done well, a small group space pays attention to the details that enable congregants to feel familiar with the space while also engaging with their surroundings — regardless of the mode of instruction. It’s a difficult, but possible, task.